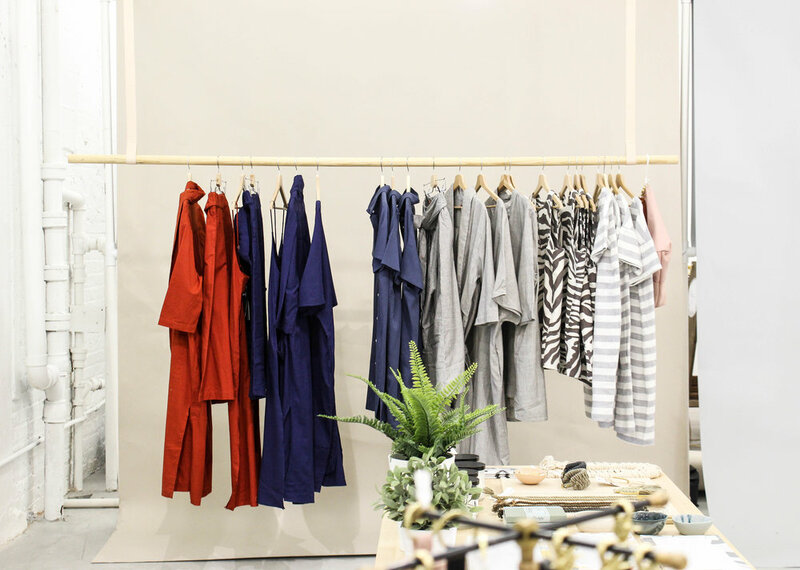 Brief Assembly is a retail pop-up concept shop located in an historic warehouse in Washington, D.C.'s Union Market district this holiday season, from November 25-December 23. We've been long-time fans of Carolyn's leather goods company, MATINE and Mallory's jewelry line, Mallory Shelter Jewelry, so we were ecstatic when these two powerhouses teamed up to create a stunning space in the heart of Washington, D.C. Carolina and Mallory gathered goods from 25 independent makers and creatives from around the county and assembled them into one perfect shop for D.C. to enjoy. Below, Mallory and Carolyn share their journey into creating Brief Assembly, how they began their own independent businesses and the best parts of being entrepreneurs in D.C.
1. Tell us about Brief Assembly! Mallory: Brief Assembly is a pop-up concept that Carolyn and I launched to bring a unique shopping experience to the DC area. It’s curated with a bunch of brands from all over the country that we love – everything from clothing and accessories, to small ceramics, paper good, and more. Carolyn: Brief Assembly is an untraditional holiday pop-up shop. We brought in products from 25 independent designers across the country to give our D.C. customers a special, curated shopping experience for the season. 2. What lead you to the concept of Brief Assembly and describe to us the process of bringing the pop-up together. Mallory: Carolyn and I were grabbing coffee together, and were kind of griping about the lack of interesting retail concepts in the city and the oversaturation of holiday markets. We both felt we had outgrown the market scene, but still wanted a holiday shopping experience that felt curated and unique and offered new brands from outside of the DC area. We initially approached Union Market about a weekend-long event, but it quickly became a longer pop-up concept in a space they were renovating. Carolyn: It happened very quickly. Mallory and I got coffee to discuss the idea of collaborating on a holiday shopping event. We wanted something for ourselves as designers that was a little more cohesive than a market experience and specifically curated to our audience. We weren't sure that it would be a pop-up shop format, but we found out that this building was available as we were having coffee that day, and within 24 hours or so we had to come up with a name and a concept to pitch! Once we were firmed up on the concept, we began reaching out to our dream list of brands to see if they wanted to participate. To our surprise, many of them agreed! We also took applications from brands and designers, and from there began to pick and choose which items we thought would be a fit for our overall vision of the space. 3. Tell us about both of your companies, MATINE and Mallory Shelter Jewelry. Mallory: I’ve been making jewelry since I was in middle school, after I inherited a large gemstone and jewelry supply collection. I worked on pieces on and off through college, and after moving to DC I started taking classes with a local goldsmith. Simultaneously, I was feeling a bit lackluster about my job at the time, so started working at the newly opened Salt & Sundry as a weekend distraction to my 9-5. I fell in love with the retail world, and Amanda kindly allowed me to try selling a few of my pieces in the shop. They sold faster than I expected, so I launched my first collection, Mallory Shelter Jewelry, in 2013, featuring stacking rings and bracelets, layering necklaces, lightweight earrings, and more. Since then, my work has been featured in Martha Stewart, Southern Living, Refinery 29, The Washington Post, and more, and I’ve grown to include my work in stores around the country. In 2015, I expanded my business to include custom engagement rings and wedding bands. I’m also currently pursuing my gemology degree from the Gemological Institute of America. Carolyn: MATINE is a line of fresh, minimal handbags and leather goods made in the U.S. We value simplicity, unique design and ethical production, which are all things that I definitely carried over to Brief Assembly too. 4. What’s the best part of being an entrepreneur in D.C.? The most difficult? Mallory: I think the best part of being an entrepreneur, specifically in DC, is the sense of community that’s here. People genuinely want others to succeed, and there’s a strong support network of other business owners who champion each other. I think the most difficult part, regardless of location, is the isolation you can feel being an entrepreneur. I work alone most of the time, and it can be hard not to have others to bounce ideas off of or get a gut check on how things are going. So much of running a small business is navigating a lot of unknowns and there’s a lot of anxiety that comes with that, so it would be nice to have others to commiserate with! Carolyn: Relative to other metro areas, this is a pretty small creative community, which I actually think is great because it makes it easier to find opportunities. It's also a highly, highly collaborative community at that, so if you can imagine something you can probably find a way to make it happen. The most difficult part is probably finding resources like workspace and local skilled artisans available for hire. Mallory: I’m a very driven person by nature, and am also quite competitive (something I’m trying to work on...but also embrace/accept). When I see others succeeding or doing something unique, it pushes me to do better and stretch my boundaries a bit. I also find that when I give my brain some time to unplug or daydream I end up with lots of new ideas. I try my best to make room for that, whether it’s a yoga class, a walk sans phone, or time in the studio to make nothing in particular. Carolyn: I love to pursue new things. If even a flicker of an idea pops into my head that seems intriguing or makes me happy, I want to explore it. I follow those paths and they tend to lead to great things. I'm also always working on delegating the portions of my business that don't require me to personally handle. It's the only way, logistically speaking, to be able to grow and avoid burnout. I've learned over the years which tasks drain, versus energize me, so I try to find ways to weight my schedule and life, really, in favor of things I enjoy. Mallory: Most days I leave my studio and head straight to a yoga class (my current favorite studio is 405 Yoga, right around the corner from my house!) After that I’ll make dinner with my husband, enjoy a glass of wine or a bath, and usually watch a show on Netflix. Right before bed I try to read for a bit! As an entrepreneur, it’s far too easy to work around the clock. While there are times I need to do work after hours, I’ve started leaving my laptop at my studio so I’m not tempted to do work in the evenings. Unless I’m particularly slammed (i.e. all of December) or I have something urgent I need to finish up, my work can wait. Carolyn: I have a 2-year-old daughter, so by the time she goes to bed I'm totally exhausted. I love to cook dinner for my husband and myself as a way to wind down, and I find it so satisfying these days to follow a recipe. I think since I'm in charge of my days, there's so much uncertainty and never really a guarantee you're doing anything "right", so it's a relief to just have instructions and finish a task! I might be able to muster a glass of wine and some good TV with my husband, but I'm usually in bed by 9:30 or 10. I will sometimes read a chapter of a book if I can keep my eyes open, but in general I prefer the sleep to recharge for the next day. Mallory: Can I share two? The first is just get started. You can feel crippled by needing to have everything just right or looking perfect, but the fact is your work will evolve and grow, and there will always be tweaks that need to be made. If you keep waiting for it to all come together, you’ll wait forever. The second is to know your numbers inside and out. I didn’t take my business seriously at first and therefore didn’t properly track my sales and expenditures thinking it was just a hobby and I would never need to earn a living from it. It took me a few years to hire an accountant/monthly bookkeeper, which was the best decision I’ve ever made for my business. As I grow, it’s imperative for me to know what I’m spending, what I’m bringing in, margins, etc. It can be a scary thing to take a hard look at, and I still try to avoid it at times, but it’s a great pulse on your overall business health. Carolyn: Ask for help! It's impossible for any of us to accomplish everything we want to on our own. Thank you carolyn and mallory! Sign up with your email address togged our Friday morning newsletter for more marketing and business insight.